Join veteran Muench Workshops pro and co-founder, Andy Williams on this two-week photographic journey though all of Morocco’s most photogenic cities, villages, medinas, markets, landscapes, and deserts. 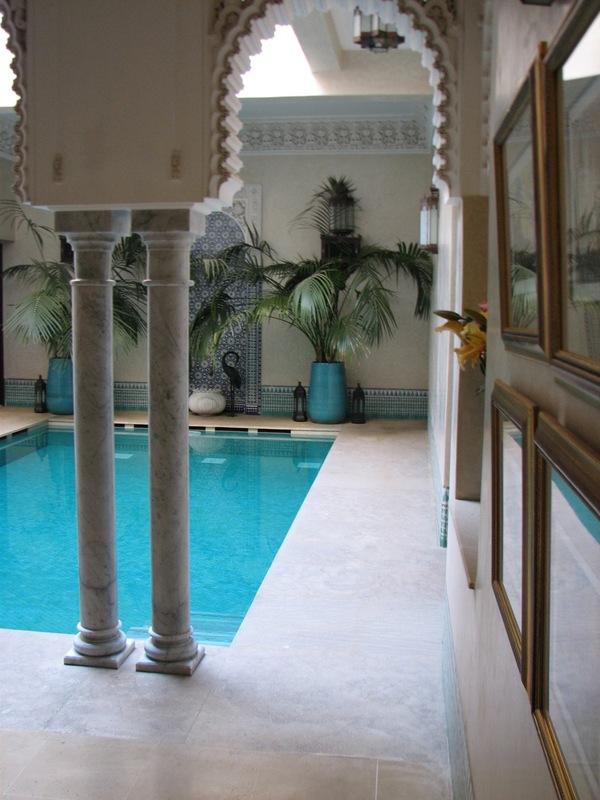 Meet us in Casablanca, and we’ll immediately immerse ourselves into the local scene and culture. From here we’ll make our way to and through Chefchaouen, Volubilis, Meknes, Fes, Erfoud, The Sahara Desert, Todra Gorges, Skoura, Ouarzazate, Ain Benhaddou, Marrakech, and back to Casablanca. Whew. We’ll travel by comfortable Mercedes Sprinter, with plenty of room for you and your gear. We have carefully chosen our accommodations to give us the best chance at the most and best photos every day, a mix of luxurious 4-star and 5-star hotels and riads (small, luxury homes that are turned into accommodations just for us!). We have one night in luxury tented accommodations in the Sahara Desert: comfy beds, electricity, hot showers, and flush toilets. We will have Wi-Fi nearly everywhere in Morocco. We’ll be photographing history, architecture, people, and landscapes. From the big city to the small village, the mosques to the intimate small details of the side streets and alleys. We’ll photograph palaces, ruins, walled cities, small towns, markets, mountains, camels, and sand dunes. We have timed our stay in the Sahara Desert luxury camp to coincide with a new moon, so we’ll have dark skies over the giant sand dunes. Expect to photograph the sunset, the stars, and then sunrise. This will be a small group, only 7 guests. Photographic instruction will be intensive, in the field as Andy works right beside you, guiding you to the best compositions. And later in the “classroom” as we work on your images, you’ll get critique and advice, and learn plenty of Lightroom processing techniques. Everything’s all-inclusive, so get ready for a fantastic time in Morroco! March 16, 2020: Casablanca. Upon arrival in Casablanca, the economic capital of Morocco, you will be transferred by van to our Casablanca hotel, where we will relax for the afternoon. Group welcome dinner will be served at the hotel. March 17, 2020: Casablanca. After breakfast we begin our tour of the impressive Hassan II mosque, situated in a small, charming medina, where we will enjoy some street photography. March 18, 2020: Casablanca / Rabat / Chefchaouen. We head towards Chefchaouen, the famous blue city of Morocco in the Rif Mountains. En route, we stop at Rabat, the capital city and residence of the King, for lunch and time to enjoy the beautiful coastal city. We will visit the King’s Palace, the La Tour Hassan, Mausoleum, and more. After lunch we continue on to Chefchaouen for the night. March 19, 2020: Chefchaouen. We have all day to photograph this “cool” town. Tucked away in the relaxed atmosphere of the Rif Mountains. Perfect for photography, this blue city offers every shade of blue. March 20, 2020: Chefchaouen / Volubilis / Meknes / Fes. Early in the morning, we will climb up the edge of the mountain for a beautiful shot of this small Berber town. After breakfast, we set out to explore the 2,000 year-old Roman ruins of Volubilis, getting a picture of life during the Roman Empire. Lunch will be in Meknes, one of Morocco’s Imperial cities. After lunch, we have a tour of Meknes, including the stable of Moulay Ismael, the Bab Mansour, and medina. In the evening we will head off to Fes, the cultural and spiritual capital of Morocco. March 21, 2020: Fes. At sunrise, we will be ready for some shots of the ancient city from the beautiful overlook. After breakfast we begin your guided tour of the medina, one of the world’s largest walled cities. We explore the narrow streets lined with fresh fruit, mounds of spices, intricately woven Berber carpets, and many other art objects of Morocco. For lunch you will eat in traditional restaurant in the heart of the medina. After lunch we complete the tour and return to your hotel for the evening. March 22, 2020: Fes. This will be a free day to explore and photograph Fes. Whether you visit the potters, King’s palace, or just wander for candid photos, Fes is worth the extra day. March 23, 2020: Fes / Erfoud / Sahara Desert. After an early breakfast we will begin our ascent across the Middle Atlas Mountains. Most of the day will be spent winding our way through the beautiful forests, jagged rock faces, and Berber villages as we cross the Atlas Mountains and begin to descend towards the Sahara Desert. Half way, we will stop for lunch in the town of Midelt, famous for its fossils and rocks. In the afternoon, we will make your way down along the Ziz River Valley. Upon arrival in Erfoud, we will jump into our 4x4s and head out to the Sahara dunes. 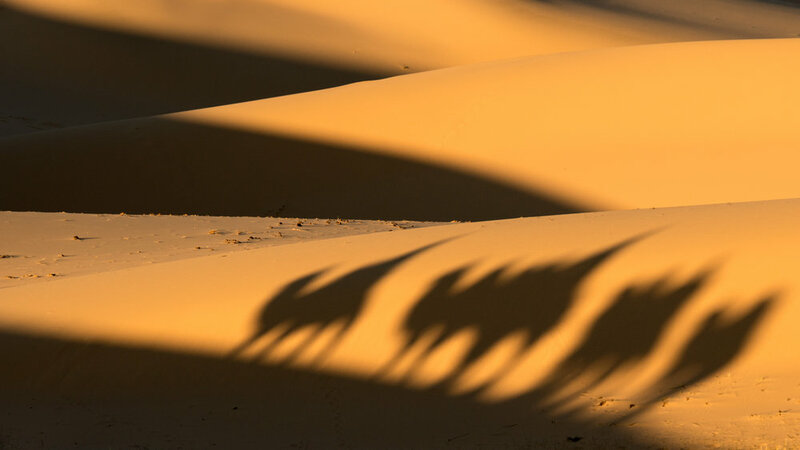 We will photograph sunset, the night sky under a new moon, and sunrise here in the Sahara desert. March 24, 2020: Sahara Desert. Our desert camp is nestled in private sand dunes off the beaten path. This modern, white-canvas tent experience mixes modern luxury with a rural desert experience! With its white linen beds and tasteful, chic décor, this Deluxe Tent experience is the most luxurious in the region. The private camp is located about 15 minutes south of the main Erg Chebbi sand dunes, which makes this experience feel more exclusive and protected from large tourist groups. Each deluxe tent has a simple, Western-style bathroom built from cedar wood and equipped with toilet, shower, and sink. 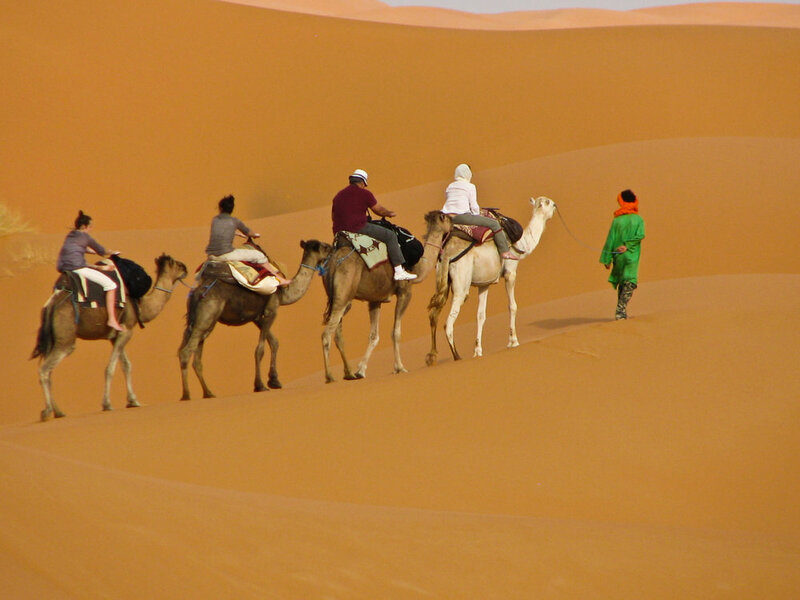 With this experience, you will enjoy a 30 minute camel ride through the sand dunes to see the sunset and back 30 minutes to the luxury camp. In the morning, we will have a 4x4 ride around the dunes and a visit the Nomadic Berber Villages. Listen to some of their music while you get some people photos. March 25, 2020: Sahara Desert / Todra Gorges / Skoura. We leave the desert by camel to the 4x4s and then head back to Erfoud, and continue on behind the High Atlas Mountains to the Dades Gorges. In the afternoon, we will take a walk up in the towering Todra Gorges (600 feet high), where you can view the picturesque river valleys as they take a beautiful journey towards the southeast of Morocco. We will stay the night in Skoura before again crossing the High Atlas Mountains. March 26, 2020: Skoura / Ouarzazate / Ait Benhaddou. We set off very early towards Ouarzazate along the route of 1,000 Kasbahs and visit the ancient Kasbahs in the palmaries. Upon arrival in Ouarzazate, we photograph this southern town, probably most famous now for the films that have been filmed in the area. We will then head out to the Kasbah Ait Benhaddou where you will shoot sunset and sunrise. In typical Moroccan fashion, the true treasures must be searched out and discovered—usually off the beaten path. In actuality, this setting has been used for more films than any other location in Morocco, including: Lawrence of Arabia, Jesus of Nazareth, and The Gladiator. March 27, 2020: Marrakech. Today we go to Marrakech over the High Atlas Mountains. Take some time enjoying this beautiful landscape. Once in Marrakech, we will check into our riad and then head off to the famous Djemaa el-Fna, the center square of the medina, and one of the major attractions of Marrakech. Coming alive at night with the local storytellers, entertainers, and mouth-watering barbeque pits, the square is well worth a visit. A quiet cup of tea on the terrace of an adjacent café provides a spectacular aerial view of the bustling square. March 28, 2020: Marrakech. We will have a guided tour of Marrakech, the southern pearl of Morocco. We photograph the Palace of the Bahia, the Saadian Tombs, and many other hidden treasures. After lunch, we will continue with the tour on to the magnificent Koutoubia Mosque. 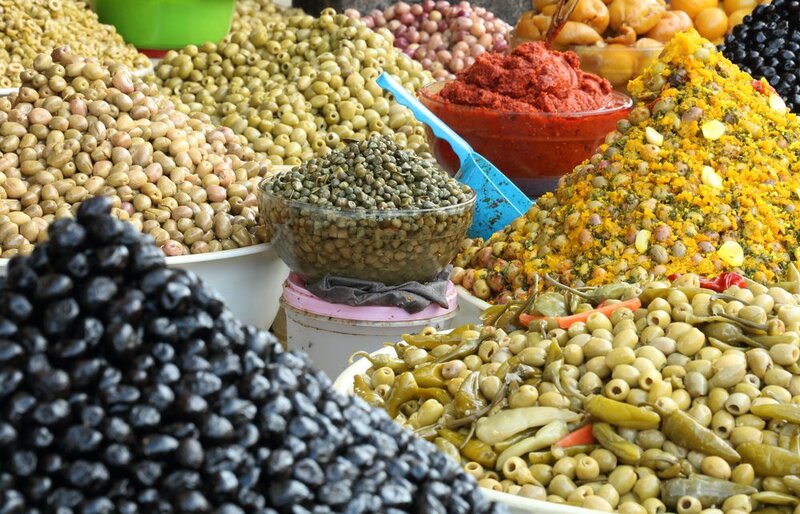 The tour will conclude with an exploration of the souk (market), perfect for photography: lined with fresh fruit, mounds of spices, intricately woven Berber carpets and many other art objects of Morocco. March 29, 2020: Marrakech/ El Jdida / Casablanca. We will drive to Casablanca but we’ll enjoy a stop over in El Jdida, where we will visit and photograph the Portuguese citadel and see the underground cistern. After lunch, we will head up along the coast to Casablanca, where we will spend our last night in the Morocco. Our final dinner will be served at a favorite local restaurant, and we’ll celebrate our two week photographic journey in Morocco. March 30, 2020: Casablanca. Flights home after 10:00 AM anytime this day. Air travel from your home to Casablanca, Morocco and back. Any meals and accommodations before or after the workshop dates. Medical Evacuation Insurance (required). Travel Medical and Trip Cancellation Insurance (optional, but recommended). Items of a personal nature. Alcoholic beverages. Anything not specifically listed as included. Your deposit of $4,000 will secure your place on this workshop. A second payment of $4,000 will be due on August 1, 2019 The balance of $3,995 will be due not later than December 1, 2019. All of our standard terms and conditions apply. Need special payment arrangements for your deposit? No problem, just ask us. Are you ready for a one-of-a-kind photographic and cultural experience in Morocco? Our group size is small and this workshop will fill up fast, so claim your spot by clicking the Sign Me Up! button now, and we’ll see you in Morocco!